I can’t say enough about these very funny book series. These books are among the most popular books in my library. I bought them because my son read every single book in the two series in second grade. This is great for second grade or for reluctant readers in older grades. There are lots of books in the series, so plenty of material for students to enjoy. This is a wonderful pre-school read aloud. The rhyming is very nice as are the illustrations. It give you a great way to talk about farms (I work in an urban school) and to interact with students as they “help” me make farm noises. Best of all, the book ends in such a peaceful way that all those wiggly bodies settle down and are ready for another book. Synopsis: A day begins on a farm. The people are away, so only animals are there to play. There are horses, donkeys, roosters, hens, sheep, goats, mice, bats, cats, and even a scarecrow. 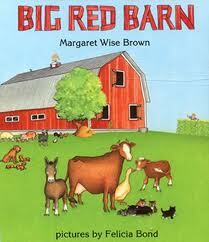 They all live and sleep in a big red barn. What a book! I read it in one night and was moved to tears by the end of the book. Carley, the main character, has a wry sense of humor that I think middle schoolers and tweens can really relate to. What really recommends this book, though, is the fact that the sixth grader I recommended it to didn’t want to return this book to the library but wanted to keep it because she loved it so much. 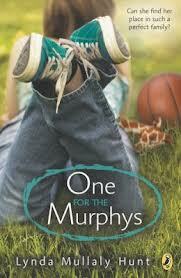 Synopsis: Carley Connors ends up in foster care while her mother recovers after being attacked by her stepfather. Carley’s foster mom is Julie Murphy, is a a pretty suburban mom with three small boys. Carley, who was also attacked by her stepfather is haunted by the memory of the attack and has a hard time liking the Murphys. She says of her new home, “The whole place smells like dryer sheets. Reminds me of the Lucky’s Laundromat back in Vegas, but it isn’t nearly as bright.” Carley slowly starts to accept her foster family and even makes a friend at school. Everything is going well until Carley’s mom wakes from her coma and Carley has to go home. This book combines wonderful black and white drawings with an element of magic that really works for older students, because there is just enough mystery to leave listeners wondering what really happened. I love to read it to third graders. Synopsis: Miss Hester owns a naughty dog named Fritz. Alan is watching Fritz while Miss Hester is gone. When Alan takes Fritz for a walk, Fritz tugs the leash and runs away – straight into the garden of Abdul Gasazi, a retired magician. Unfortunately, Mr. Gasazi’s garden is clearly marked with a sign that says ABSOLUTELY, POSITIVELY NO DOGS ALLOWED. When Alan meets Mr. Gasazi, he politely asks for Fritz back but is dismayed to learn that Abdul Gasazi turns naughty, straying dogs into ducks. Convinced that Fritz is now a duck, Alan returns to Miss Hester’s house, only to find Fritz safely at home. 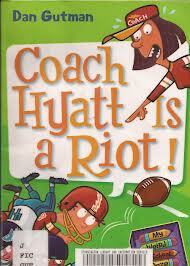 My third graders were so happy when I read this funny book today. It delivers a great message about staying true to yourself. Written by a student favorite author, David Shannon, this book is full of great, full colorful illustrations that really capture my listeners’ attention. Synopsis: Camilla loves lima beans. 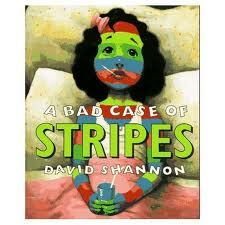 But, admitting that she likes lima beans will make her unpopular at school. So, Camilla doesn’t eat lima beans. Unfortunately, one day, Camilla wakes up with her body covered with stripes. Her doctor declares her fine to go to school; but, when she goes to school, Camilla’s classmates quickly realize that they can change her colors by talking about different things. Her parents call in specialists and then experts. All their prescriptions end in disaster until an old lady comes to the door with…you guessed it…lima beans. Camilla decides that being unpopular because she likes lima beans is much better than the alternative.